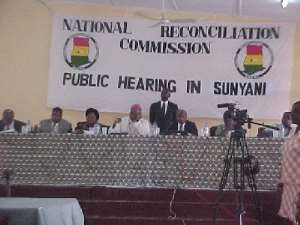 AHEAD OF the October 14 deadline set for the submission of the final report by the National Reconciliation Commission to the government, a cross section of Ghanaians have expressed their views on what they expect the commission's report to be. The NRC brings its findings to a close on July 13, 2004 and is expected to submit a report to the government on October 14, 2004. Basically, the majority of the people say they expect the commission to come out with a very comprehensive report that could be read and well understood by almost all literate Ghanaians. Unlike reports of other commissions and committees set up by government, which are often known to government officials only, majority of the people who spoke to The Chronicle on the issue say they expect the government to make the commission's report a public document, which should be accessible to all. "In fact, I would expect the commission's report to deal comprehensively with what should be done to people who have been offended in various ways, so they could feel adequately compensated rather than just present blank recommendations," one of the respondents to the paper's query stated. Another point of interest to the public as far as their expectations of the NRC's report was concerned was that, it must contain the appropriate recommendations through which people like the former president, J.J. Rawlings, could publicly apologize to all who had suffered various forms of human rights violations during the AFRC and PNDC days. "Whether Jerry was personally involved in the human rights violations or not, he should be held responsible for the atrocities that occurred under his leadership. The commission's report should, therefore, be such that the former president would be made to apologize publicly to all who had suffered under him," it was argued. The report, as demanded by the public, should state clearly the veracity of some of the issues such as those raised by Messrs. Chris Asher and Mathew Adabuga, which Ghanaians are yet to establish as factual or otherwise. According to a respondent, the recent refusal by the two personalities who had made earlier submissions implicating the former president and other top former government officials like Capt (Rtd) Kojo Tsikata, to make themselves available for cross examination, should not be cited by the commission as an excuse for not making Ghanaians aware of the truth, or otherwise, in the issues they had raised at the commission when they appeared before it sometime last year. "The commission should let us know people who were guilty of certain human rights abuses and whether some of the submissions by some of the petitioners, which were very mind-boggling, were true or false," Mr. Frances K. Badu, a 49-year old civil servant opined. On the relevance of the commission, most of the people who spoke to the paper, expressed the view that the commission had lived up to the task for which it was established. The appearance of the former president and other former government officials to respond to allegations leveled against them was cited as instances that supported the fact that the commission was really pursuing the genuine purpose of getting the nation reconciled. A few voices pointed out, however, that the NRC was deliberately set up by the NPP to hype certain alleged human rights violations that took place during the days of the AFRC and the PNDC in its bid to discredit the NDC, and subsequently win the impending December general election. Meanwhile, the Executive Secretary of the NRC, Dr. Kenneth Attafuah, has given the assurance that the commission would do everything possible to come out with a very comprehensive final report on its deliberations. He disclosed that given the large number of petitions yet to be heard by the commission as against the time left, the commission would be giving priority to petitions dealing with cases that occurred within the stipulated period that it was supposed to cover. Dr. Attafuah was emphatic that the commission would come out with the necessary recommendations that would meet the aspirations of all who had been affected in one way or the other. On what might be some of the possible recommendations of the commission to compensate victims of human rights violations, he hinted that the compensations may include payment of cash, having streets named after some people, erection of monuments in honor of others, de-confiscation of assets, an education fund for the children of victims and social security policies for others.